A restaurant in Chicago has angered many Hawaiians after claiming the word “Aloha” as its own and sending cease and desist letters to other restaurants using it. Chicago-based poke chain Aloha Poke reportedly forced a poke shop in Fairhaven, Washington to change its name in response to a cease and desist letter it received, Eater Chicago reported back in August last year. Examples of the more recent cease and desist letters show the company has issue with other companies, many of which are owned by Native Hawaiians, using the words “Aloha” and “Aloha Poke” in their company services. Aloha Poke has expanded to a dozen locations in the United States two years after starting its operations in Chicago’s French Market in 2016. The company, which is run by non-Hawaiian Caucasian owners, was heavily criticized online for allegedly trying to take ownership of a term with a deep cultural and spiritual significance to Native Hawaiians. Niheu, who is known for being an advocate for Kanaka Maoli (Native Hawaiian) families, said she has heard complaints from local business owners who had received legal threats from Aloha Poke. She pointed out that Native Hawaiian communities are “not rich” and that their businesses are both labors of love and a means of survival. Netizens have since flooded the poke shop’s Yelp and Facebook pages with negative reviews. Niheu has now called upon Aloha Poke to change its name via a petition on Change.org. Hawaii State Rep. Kaniela Ing, took to Twitter on Sunday to post a video pointing out that threatening native Hawaiian families with legal action over the word “aloha” is an insult to the very word. “All we ask that if you’re making so much money off our words, our values, our food, our culture, that you at least hear us,” he said. “I am truly sorry that anyone, especially native Hawaiians, have been offended by this situation. I want them to know I have nothing but love and respect for them,” Friedlander wrote. 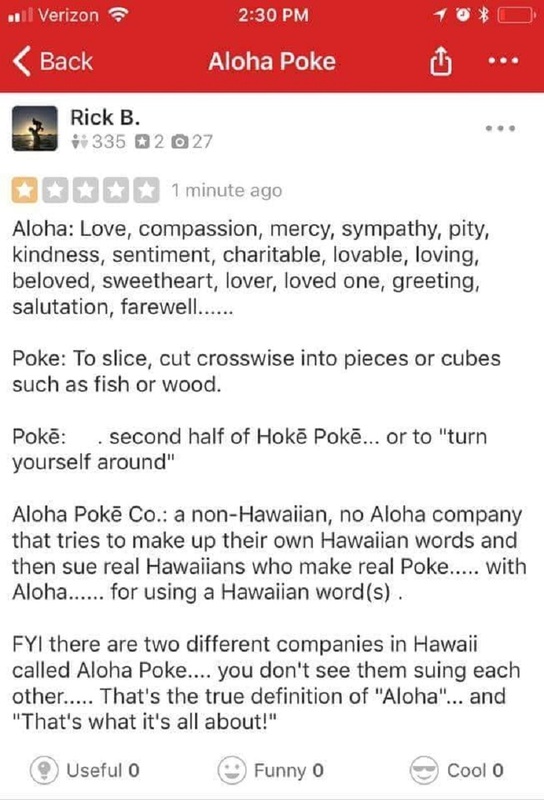 Aloha Poke Co has since issued an apology on Facebook that has widely been criticized in the comments for being insincere as well as denying the company’s claim on the term “Aloha,” contrary to what the company’s infringement notification letter states.